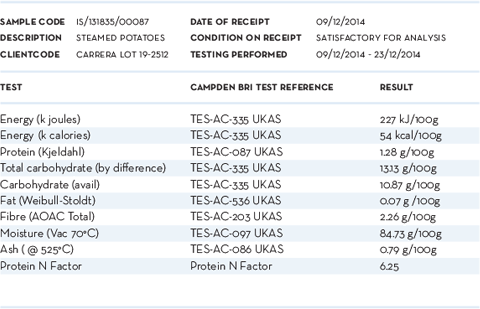 SunLite potatoes are tested by official authorities and have a proven 30% lower caloric value than average potatoes. Therefore they are allowed to be marketed as light potatoes. Potatoes are low in calories if you compare them to other carbohydrate rich nutritional foods. However, SunLite potatoes are even lower in calories and therefore are a very good choice for people taking care of their weight. Next to that, potatoes have lot’s of good nutrients as well. Consumers who want to loose weight or are weight conscious, but still likes to share a tasty diner with the rest of the family. SunLite is a light and fresh consumer brand, which immediately stands out on the shelf as a low calorie product. The unique selling point is the 30% less calories than average potatoes, while the potatoes are still full of good ingredients. Further do we emphasize on the cooking use of the Sunlite potatoes and the appealing dishes that can be made. Potatoes have lots of vitamin C and are a very good source of potassium, fibers and vitamin B6. Next to that, potatoes are very low in sodium, they have no cholesterol or fat. They also contain various other important minerals, such as magnesium, phosphorous, iron and zinc. That’s the advantage of Sunlite potatoes: Low in calories, still full of good nutrients! Fibers help to prevent constipation (together with water and exercise). Magnesium, zinc, and copper contribute to strong bones and teeth (together with calcium). Rich in carbohydrates, which stimulate brain activity and are stored to provide energy. Vitamin C is necessary for healthy skin and hair and for strong bones, teeth, and gums. Vitamin B1 is necessary to release energy from carbohydrates. Vitamin B6 is a vital nutrient for a healthy nervous system. Iron contributes to healthy blood. Source of potassium, which helps maintain your blood pressure. Source of folic acid, which is necessary for making new cells and protein for healthy blood. The Sunlite varieties are rather firm cooking with a soft texture. Therefore they are ideal to boil, mash or bake. Steaming, using them skin-on or prepare them in the microwave is also possible. So altogether, Sunlite potatoes are the perfect versatile potatoes to be enjoyed daily by health and weight conscious consumers. Potatoes differ in their energy value depending on the variety and growth conditions. A claim referring to a product’s reduced energy value can only be valid when the actual energy content of that product is at least 30% less than the average energy value of the product category to which the product belongs. This regulation applies to all nutrition and health claims made in commercial statements. SunLite® potatoes meet those criteria and therefore, SunLite® potatoes are marketed to consumers based on an officially allowed claim, indicating their lower caloric value compared to the average of the product category potatoes. The lot samples which are likely to fit the SunLite® specifications are measured in a certified laboratory using 6 official protocols (see table). 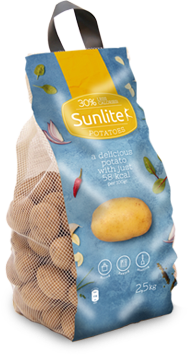 The SunLite® concept promises good quality potatoes with a proven lower caloric value. Therefore growing guidelines and quality measurement are an essential part of the SunLite® concept. Cultivation in the right soils and circumstances. Meet defined cultivation conditions and follow specific instructions. In the final cultivation phase (before haulm killing), samples are taken to determine the optimal harvest time in order to obtain the intended caloric value. Final check on caloric value. We currently have three varieties in the HZPC range which are ideally suited for the SunLite® concept. Next to choosing the best variety, it’s important to select fields with the required soil types, the availability of irrigation and follow the fertilization advice in order to obtain SunLite® specifications. Copyright © HZPC. Want to know more? Visit www.hzpc.com.